Eyeteeth: Incisive ideas: Cannon cozies: Happiness is a warm gun? Cannon cozies: Happiness is a warm gun? 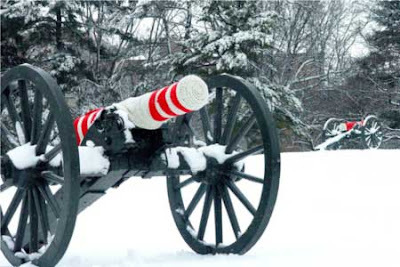 Anna Campbell's Warm Guns series (via Wooster Collective) features the artist knitting, hauling (past an Army recruiting office, in one documentation shot) and placing on Civil War cannons red-and-white, hand-knit cozies. The works seem nostalgic for our well-intended and mythologized colonial roots, while also either feminizing or dampening the sharp edges of wartime symbols. Or, more directly, perhaps it says said "warm guns" -- unlike the just-fired variety -- are better kept warm using other methods. 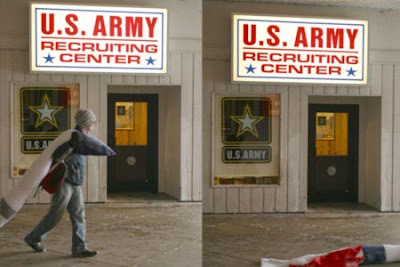 While Campbell's website offers no specific statement on the project, she does say that her work "indulges in the guilty pleasures of romanticizing failure and idolizing drive for its own sake, but the high stakes attached to unromanticized failures, whose consequences are particularly disabling for marginalized people, tempers this idealization and creates a central tension in my work."